It’s been a lovely start to summer in Wales. At the beginning of July, we launched our new Junior Summer Programme Centre in North Wales and welcomed our young learners to the boarding school campus located by the seaside in Colwyn Bay. A warm Welsh Welcome to our students from Guatemala! It's been an extremely lively summer with our Junior groups at Celtic English Academy. We had students from Spain, Italy, Vietnam, Russia and Turkey all studying with us. It was fantastic having all the different nationalities together; sharing their culture and improving their English skills. The teenagers studied a diverse range of topics and produced some excellent project work. Highlights included: "The Dirty Sock Museum", an infographic on the history of coal mining in Wales, an invention which made your dreams come true (The Magic Hat) not to mention a play which the students wrote and performed themselves! The #AFSeffect in Cardiff this summer! This summer season we, at Celtic English Academy had a pleasure to host wonderful students from Intercultura, Italy and AFS Turkey. The group stayed in our student residence in the city centre and followed our summer English language course for young learners. The students had the opportunity to combine English language learning with activities and visits to many exciting places. Last week we said a farewell to a wonderful group of young learners from the Canadian English Council (CEC), Vietnam. They have followed our group course for young learners which involved English lessons in the morning, fun activities in the afternoon, and cultural trips at weekends. Recently we hosted a tremendous group of young learners from Thailand. They followed a bespoke course which involved English lessons in the morning, fun activities in the afternoon, cultural trips at weekends, not to mention the chance to spend a week at a local high school. Yesterday we said a fond farewell to the children's group from Beijing, China. The Beijing Joy group lived up to their name as all 42 children were a joy to teach. The children, aged from 8 to 14 years, had a real passion for learning English and they achieved so much in just a week at Celtic English Academy. Celtic Academy would like to welcome our recent student PON group from the South of Italy. Celtic English Academy Juniors are having a splashing summer in Cardiff! Besides learning and improving their English, the Celtic English Academy Junior programme are having the best summer ever here in Cardiff. 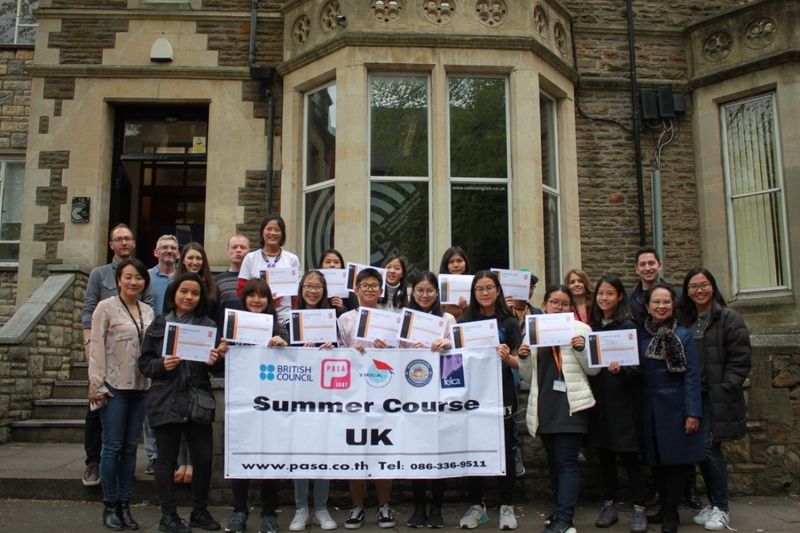 This spring and summer season Celtic has welcomed a number of Spanish and Italian school groups on short study stays in Cardiff. The groups have stayed with host families in the city or in the brand new YHA Cardiff Central hostel accommodation. Whilst the summer students have enjoyed all the trips and activities outside of the classroom, a great deal of learning and fun has been happening inside the classroom too!